I love brand new magazines. They are the lifeblood of any short story reader. New magazines often have fewer conventions and allow their authors to push the boundaries further, so I feel you get a more eclectic group of writing than you might in already well-established publications. I also love the feeling of discovery, and often first issues don't disappoint. It was with this in mind that I opened up Issue # 1 of Occult Detective Quarterly, edited by Sam Gafford and John Linwood Grant. I always judge a publication by its cover--it's the first impression a reader gets. For the most part, I thought the graphics complemented the content really well, conveying a polished retro style that screamed "hard-boiled" from the color cover to the black and white interiors. 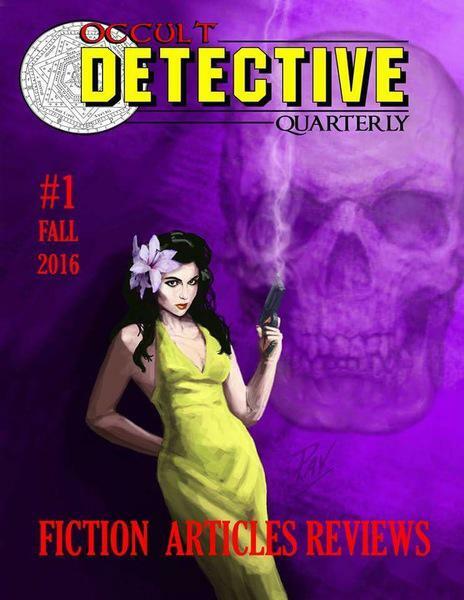 This first issue had seven short stories, the first chapter of a serial, an article about Doctor Spektor and interview with its creator, a tongue-in-cheek how-to about ghost hunting, and reviews of three works featuring the supernatural. Most, if not all, of the fiction found within its pages had the feel of old-school adventure stories, containing tortured and sometimes oddball antiheros, mysterious murders, and inexplicable and magical happenings. Pulp literature, in general, is a literature of vices. The pillars of these include smoking, drinking and gambling--the latter not in dollars, but with lives. In the pages of ODQ, there are the classic flea-bitten PIs, the ex-cops and journalists, and the apprentices who must follow their masters into uncertain undertakings. Even in "When Soft Voices Die" by Amanda DeWees, a story set in the 1800s, the female protagonist is not a demure and virginal little miss, but rather has a scandalous background (for the time in which it is set) of a former actress and a widow to boot. Most of the characters in these stories are free-wheeling adventurers who might have powerful magic on their side, but it's seldom magic they completely control or entirely understand. There comes a point in each story where the character has no idea what they're getting into, but they persevere anyway in the face of great odds. Pulp is also a literature of voice. From the feature story of a wise-cracking gorilla detective in "Got My Mojo Working" by David T. Wilbanks and William Meikle, to a been-there-done-that odd job man in "MonoChrome" by T.E. Grau, the tone is often jaded, with strong touches of sarcasm--and a wink and a nudge towards the reader. The fourth wall is usually cast aside, and the characters tend to speak directly to the reader throughout the pages of each story. As such, fully half of the eight stories are told in first person, with many of them in a quick-to-read, conversational style. While I enjoyed a number of stories in the issue, I must say that the real star of the collection for me was "MonoChrome" by T.E. Grau. From vivid scene-setting to superb pacing, this story is told in a slow, literary reveal that incorporates a somewhat surrealistic narrative and elements reminiscent of the best horror movies. To give you a small taste of Grau's style, here is a stark picture of the home of the main character, Henry Ganz, an alcoholic and former cop whose best days are behind him. I enjoyed the mystery of Grau's piece, the description and dialogue, the small hints and motifs throughout the story, and the building of tension that leads to a spectacular and satisfying ending. I feel that the magazine will certainly appeal to fans of the genre, but there were a few things that stuck out to me as a reader. In terms of background, all the pieces are set in the U.S. or the United Kingdom, and I would have liked to see a little bit more diversity of the characters and variety of locations--maybe a murder mystery in the Congo or a ghost story in Japan. While the overarching theme of the magazine hearkens back to the days of pulp, I feel that there are elements that can be modernized, since we live and read in a global society. And while I enjoyed reading the reviews and learning a bit more about the history of the occult detective genre, I was disappointed that a page had been accidentally left out of the article, "How to be a Fictional Victorian Ghost Hunter (In Five Easy Steps)" by Tim Prasil. I'm sad to say I'll probably never be a good ghost hunter, since two out of the three steps were on the missing page. Perhaps they'll do a reprint of the missing page in the next issue or on their website--I thought it was fun to learn about ghost hunting trends in literature, and I'm sure I'm not alone in wanting to see the remainder of the article. But a first issue also includes getting your editorial legs under you as you work out the kinks, so I don't think that there were any grievous errors that would make me not pick up the next issue. This was a very beautiful and well-put-together publication. I hope you enjoy reading it as much as I did--and look forward to Issue # 2. 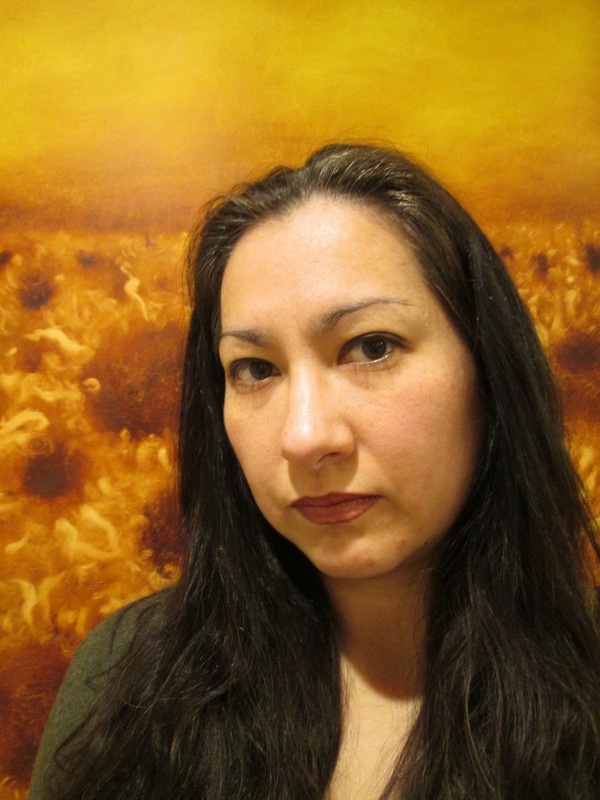 Alison McBain is an award-winning author with more than forty short stories and poems published, including work in Flash Fiction Online, FLAPPERHOUSE and The Gunpowder Review. When not writing fiction, she is the Book Reviews Editor for the magazine Bewildering Stories. Alison lives in Connecticut with her husband and three children.